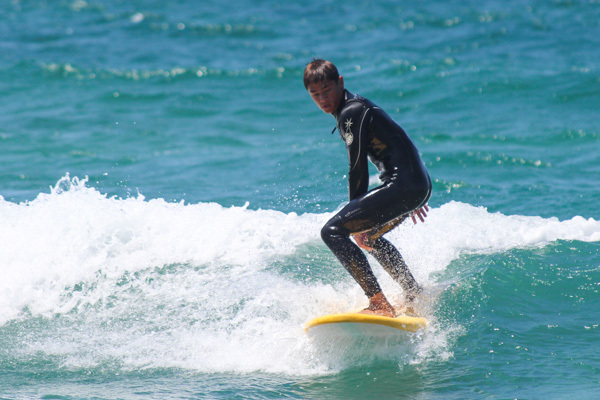 San Diego is the perfect place to learn to surf in one of our group surfing lessons or classes. Mission Beach offers some of the best waves to learn to surf. Our experienced instructors will teach you the basics of surfing in the classroom and on land before heading out into the surf to catch some waves. We offer one, two, or four day surfing classes to fit your schedule. Surfing can be a challenging sport to learn, so the more time you are able to practice, the better. The Surfing-Four Session is the most comprehensive recreation surfing class that we offer and will give you the most practice time in the water. The Surfing-Two Session is a great option for those wanting to learn more than just the basics and will give you more time practicing side-by-side with our surf instructors. If your schedule only allows you to spend one day learning to surf, then the Introduction to Surfing class is a great option to try the sport. In all of our surfing lessons you will learn the basics including surfing etiquette, safety information, tides and currents, wave formation, and information about local conditions and surf breaks. All lessons and classes include all necessary equipment (surfboards, wetsuits, rashguards). Learn the sport of surfing through our most popular and comprehensive surf class. The course begins with a lecture on the fundamental topics such as tides, swells, currents, surf conditions, proper equipment, terminology, and etiquette. You will then put this knowledge to practical use by charging the waves of Mission Beach. The majority of the class will be spent catching waves with instructors coaching from the water. 5/11/2019-5/19/2019 4 Sa Su 9:00AM-11:30AM Enroll! 6/1/2019-6/9/2019 4 Sa Su 9:00AM-11:30AM Enroll! 6/4/2019-6/13/2019 4 Tu Th 4:00PM-6:30PM Enroll! 6/17/2019-6/26/2019 4 M W 4:00PM-6:30PM Enroll! 6/15/2019-6/23/2019 4 Sa Su 9:00AM-11:30AM Enroll! Designed to teach you the fundamentals of surfing in two sessions, this class is perfect for the aspiring surfer to learn the basics in the weekend. 5/11/2019-5/12/2019 2 Sa Su 10:00AM-12:30PM Enroll! 6/1/2019-6/2/2019 2 Sa Su 10:00AM-12:30PM Enroll! 6/8/2019-6/9/2019 2 Sa Su 10:00AM-12:30PM Enroll! 6/15/2019-6/16/2019 2 Sa Su 10:00AM-12:30PM Enroll! 6/22/2019-6/23/2019 2 Sa Su 10:00AM-12:30PM Enroll! 6/29/2019-6/30/2019 2 Sa Su 10:00AM-12:30PM Enroll! Learn the basics of surfing and experience the thrill of riding a wave. This session will briefly discuss the fundamentals before you paddle out into the surf to start catching waves. 5/4/2019 1 Sa 12:30PM-3:30PM Enroll! 5/18/2019 1 Sa 12:30PM-3:30PM Enroll! 6/1/2019 1 Sa 12:30PM-3:30PM Enroll! 6/15/2019 1 Sa 12:30PM-3:30PM Enroll! 6/29/2019 1 Sa 12:30PM-3:30PM Enroll!